Want to make some extra money? Have a think about becoming an Airbnb host – it’s a simple and lucrative way of earning some cash. 2019 is set to be the year of the side hustle. More and more people are starting up ways to earn extra money on the side, as the cost of living goes up, and the opportunities to earn extra income increase. We are living in an age where you can make money in so many different ways, and can even scale them into full-time businesses. Airbnb is a perfect example of a side hustle that you can start today, with the potential of expanding it into more, if you want. How Do I Become a Host For Airbnb? How Should I Choose My Listing Price? Is There An Airbnb App? Congratulations, You’ve Got Your First Booking! Now What? More Questions About Becoming an Airbnb Host? Chances are, you’ve heard of Airbnb before – they are very much a household name now, and a very popular company indeed. It was founded back in 2007, by roommates and former classmates Joe Gebbia and Brian Chesky. They couldn’t afford their rent, so they came up with an idea of putting an air mattress in their living room and turning it into a bed and breakfast (hence the name). They put together a website for people to find accommodations for those who were struggling, and it proved to be wildly popular, with both hosts and travelers alike. If you wish to use Airbnb, you can search for the area in which you wish to travel and it will show you all of the listings, with prices, reviews etc. If you wish to host on Airbnb, you can list pretty much any type of property and earn some extra money for your trouble. Airbnb doesn’t own any of the property listed on the site but acts as brokers – taking a fee from every booking made. Think about what you want to list on Airbnb for people to stay in. Is it a room, your whole house, a rented accommodation? There are loads of different places to stay on Airbnb – it’s not just for the usual houses like you may think. There are boats, pods, campers, tents and a whole bunch of places that you wouldn’t even think of listing for people to stay in. One of the best ways to make extra money, in my opinion, is to use whatever you already have. An example of this being your home – if you can make money from your home and get it to cover your mortgage, you’re laughing. Signing up to host on Airbnb is free, and a pretty simple process. Before you sign up, there is a handy calculator on the Airbnb website that will show you how much you should be able to charge for a place in your area. What you are listing e.g. entire place, private room, shared room. To provide essential amenities. These include at least one towel per guest, toilet paper, soap, linen and/or sheets, at least one pillow per guest. Having a good response rate. Listing your property is free of charge, but when you have made a booking, Airbnb will take a service charge, which is 3% of the total booking amount. The amount that you choose to list your place for is up to you – but it’s worth taking all factors into consideration. The best thing to do is to look at what price other listings near you are listed for, and to compare them to yours. It’s up to you how much you list your property for, but something else to bear in mind is how much it will inconvenience you. If you are going to be sharing the house with people, you may not want to do this if it’s not going to net you much money. Before you rush into this, we want you to double check all of the things that you have to do in order to get started and be successful. When it comes to making extra money, a lot of the time there are some additional fees that you will have to pay that you may not be aware of – they are only small, but we just want you to know everything from the start. Airbnb hosting fees include the standard 3% taken by Airbnb, host protection insurance, taxes, supplies (e.g. toilet roll), and cleaning services. You can, of course, fix this into your fees when you are setting them. All cities are different, so it’s worth checking what the laws are in your area when it comes to short-term listings. As you know, it can be pretty confusing when it comes to laws over different cities and states. Some cities have laws that are part of zoning or administrative laws, which affect you being able to list your space to paying guests over a short period of time. In a lot of cities, you have to register, get a permit or get a license before you are able to put your listing up – so this is definitely something that you need to check before you get your property online. Airbnb has lots of helpful information on their site, and you will be able to check your local laws and regulations there. Taxes are a complete minefield as you probably already know, and there is no one size fits all approach when it comes to taxes. Airbnb is a great site to advertise on, because one of the things that they help you with, is the Airbnb Host Guarantee which provides protection for up to $1,000,000 for damages. This is to cover any damages caused by the guest when it is above the security deposit. Please note that this insurance doesn’t cover cash, jewelry, damage caused by pets, rare artwork, collectibles or personal liabilities. It is recommended that you remove all valuables before your guests arrive. You may want to look into getting a separate liability insurance policy as well, as many homeowner insurance policies have an exclusion in the policy which relates to business activity. The policy can reject any claim related to this. Do your market research and see what the other listings near you are on for so that you have something to base your prices off. As mentioned, creating your listing is free, and is simple to set up. Enter the type of property that you are listing e.g. apartment and the type of property e.g. house. You will also need to say if it is where you will be residing with your personal items, or if it is primarily for guest stays. Next is the information needed about the property. Things like the amenities (e.g. Wifi, TV), the sleeping arrangements, bathroom arrangements – basically anything that your guests would need to know about the place that they are going to stay in. Potentially the most important step now – the photos. The majority of your bookings are going to be made based on your photos, so it’s worth getting some decent ones done. This is another area in which Airbnb is super helpful – they offer Airbnb host tips on how to get the best photos, such as taking photos during the day, using a resolution such as 1024 x 683 px. Time to provide a brief summary of your listing. If you’re unsure what to write here, you can look at other listings to see what other hosts have put, and also what grabs your attention within them. You’ve got 500 words for your brief description, so make sure it’s good! You can then name your listing – this is your chance to grab potential customers’ attention, so make sure you have a good think about this. The next step is to choose your guest requirements. This is where Airbnb is a great company to deal with because you can choose when you have guests. You can also choose to set up reviews of guests – so that you can check on your guests before accepting them. Set up your calendar next – let your guests know when your home is available to book. Now the final step – choosing which price to charge. Don’t forget to look at other local listings to get a good feel for the best price. There is an Airbnb host app available, with the ease of switching to your guest account if needed. You can change your listings, use your Airbnb host login to easily answer messages quickly from guests, and keep up to date with it whilst on the go. It’s in your best interest to be as good a host as possible, because aside from the obvious reasons of wanting to do well and ensure your guests have a good time – you want them to leave you good ratings, and secure lots of future bookings. 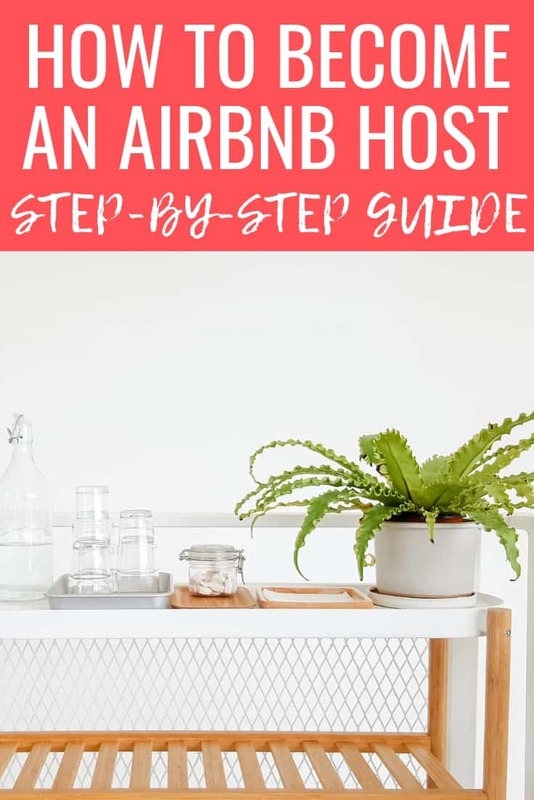 Read through the below to get started on your Airbnb host checklist – there are certain Airbnb host obligations that you will need to make. If the place that you want to list is one that you are currently occupying, you are going to have to speak to your landlord to check with them to see if it’s ok.
You will need to look at splitting the profits in some way with them, which will obviously help with convincing them with saying yes to your new side hustle. When it comes to housing, like it or not – neighbors can make or break a place. You want your neighbors to be polite to your guests, and also your guests to be polite to your neighbors. Hopefully, you are friendly with your neighbors already, but even if you think that they would be fine with it, it’s a polite thing to do to speak to them and let them know your plans in advance. Let them know things such as how often you are planning on having your place occupied, and if they would like any specific rules in place so that they aren’t bothered too much – such as the noise levels, smoking and where they are going to park their cars, etc. How much money do you want to make from Airbnb? It’s a good idea to have a plan of action before getting started. Do you want it to be a way of making a little bit of money on the side, or do you want this to turn into a career for you? The way that you view it will help you with your pricing and how hands-on you want to be. Do you want to leave your guests to it, or do you want to meet and greet them? Will they be in your home at the same time as you are living in it? When your guests have made a booking with you and are staying in your place, it’s your responsibility to ensure that they are safe and secure. It is great to be a host, but you need to remember that you have a certain responsibility for your guests. This is essential, and you will need to meet government safety guidelines for your area. Ensure that you have a working fire extinguisher, smoke alarm, and carbon monoxide detector and carry out the required maintenance for them all. This is something that you will want to consider – do you want to allow children to stay in your space as well? If you want your listings to be inclusive of children, make sure that they are properly childproofed, or let your guests know about any potential hazards in your listing details. The last thing that a guest wants when they turn up to their accommodation is a nasty surprise. Make sure that you are upfront and honest about everything within your property. It is not worth the negative reviews and bad user experience just so that you can secure a booking. Tell them everything within the listing – the good and the bad, and they will appreciate your honesty. As friendly as you should be with your guests, you should maintain a degree of professionalism. Even if this may be a small side business for you, a way of getting some extra income in to help you with your bills, try and view this as a business and treat it as such. You’ve got your professional photos up, your listing is inviting and friendly – and you’ve managed to secure your first booking! Congratulations. But what’s the next step? Yes, I’m putting it out there! There is always the possibility that something could go wrong, and you end up with squatters in your property. This is unlikely, but you can still take precautions. Check your guest’s identity, and you are also able to check reviews left on previous bookings. Airbnb gives you the ability to “require Government I.D” before booking. Something to remember after your guests have checked out is to change the code (or key) for the doors. This is the fun part (apart from receiving the money of course) – prepping for your guest’s arrival to check that it’s all ready for them to have the best stay with you. Get all of your valuables out of the place and make sure you don’t leave anything lying around that you wouldn’t want to find missing upon checking after departure. Time to tidy up and get everything clean as a whistle. Your guests want to be comfortable, and a lot of the time will compare to a hotel stay – what standards are you personally used to within hotels, and can provide for your guests? Think a clean, warm living space with inviting decor and a cozy feel. Hotels usually have extra towels and blankets. Do you have good pillows for them to use? All of these little things really add up. As well as wanting to be a good host in general, you also want good reviews and recommendations. You need to stand out in your guest’s mind and for them to notice the extra effort that you made. We have stayed at a couple Airbnb’s and it always makes a huge difference when the host goes out of their way to make it a good stay. Things like leaving some snacks for your guest upon their arrival. The best thing you can do is personally be there to greet them upon their arrival. This personal touch will go very far with your guests. Are they new to the area? Offer to show them the sights, and let them know the best local places to visit. Good reviews = more bookings. When you are personally looking at somewhere to stay, you are more than likely going to look at the reviews left by previous guests. Keep the place clean, be responsive to your guests questions, polite, professional and do whatever you can to avoid canceling on guests at the last minute. If you’re anything like me, you’ll probably have a lot of questions due to wanting to do it all perfectly. Luckily, Airbnb is available to help you 24/7 with any queries, with a service line for hosts. For the US, the numbers are: +1-415-800-5959 +1-855-424-7262 (toll-free) +1-888-326-5753. Alternatively, you can always drop them a DM via Twitter via @Airbnbhelp, or via the contact form on their Contact Us page. There is an Airbnb host forum where you can find a wealth of information discussed by other hosts, and ask your own questions if needed. If you prefer Facebook, there is an Airbnb Hosts Facebook page as well. Simply do a search for local Airbnb host forums and Facebook pages. Have you ever wanted to become an Airbnb host?